There has never been a more exciting time to work in mixed reality (MR) and spatial computing. Consumers have powerful augmented reality devices in their pockets (their ARKit and ARCore phones), they’ve experienced the delight of AR layers like Snapchat face filters, and users and brands alike are dreaming about what else is possible. What’s next? As a researcher and educator, I’ve spent the last two years teaching virtual reality (VR) and augmented reality (AR) classes for UX designers of all skill levels at design conferences like UX Week and UX Strat. Through these courses and workshops, I saw a painful truth. While the industry was figuring out key technology and hardware considerations, designers were left on the edges, waiting for more market clarity, fewer barriers, and yearning for a quick way to get started. To help designers and brands start working in augmented reality, on January 24th, I’m partnering with Torch and 52 Limited to host a half-day workshop, on interaction design in augmented reality. You’ll leave the workshop with a foundational understanding of spatial design principles and a functional mobile AR prototype. This will be an accessible learning environment so even if you’ve never worked in 3D before and AR is new to you, please sign up. In December 2018, I partnered with Torch on a version of this workshop with UX designers – Here’s a quick recap of the workshop, how the designers worked in 3D, and some key takeaways from the day. Remember to get your early bird tickets today. I’m a behavioral scientist by training and have worked in XR for two years working on the social dynamics in Virtual Reality. I get excited about mobile Augmented Reality because how accessible the technology is since it leverages devices that most people already own. To start our workshop we reviewed three live use cases for augmented reality that add unique value to simple ideas. Each project conveys new or additional information through engaging and spatially-relevant tactics – which cognitive science shows can improve learning, attention, and memory. 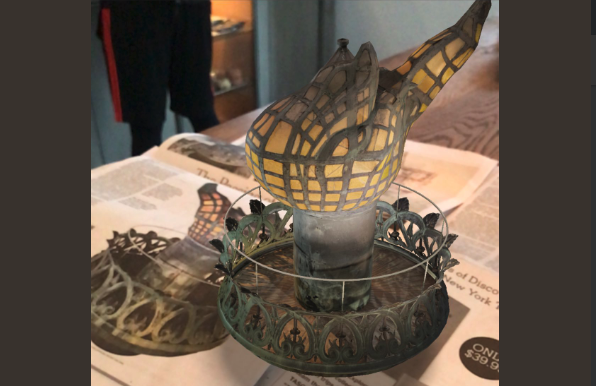 The New York Times created an AR experience inside of their current NYT app that lets people tour the Statue of Liberty’s torch up close. This annotated tour of the torch is very appealing and helps viewers learn more about the history of the torch (it was shipped from France to the U.S. in 1885) or 19th-century manufacturing processes (it was originally made of solid copper and had zero lights included). Wayfinding is another very accessible use for augmented reality. Here’s an example from Torch CEO Paul Reynolds. Paul’s office building used to be four separate buildings that have been attached and combined in a warren of modular creative spaces. Finding the Torch office can take a while if you’re unfamiliar. For our December 15th workshop, I sent the participants this video ahead of time so they’d be familiar with the building and would have fun getting to the workshop. Showcasing the capabilities of AR as a platform is a piece from Oregon-raised and California-based artist Cabbibo. Cabbibo published an app called Arquawhere users can build their own aquariums – adding fish, plants, coral, and other objects to their underwater world. The result is an experience that gives people the ability to create scenes that evoke wonder and delight. To begin the workshop, we started with an overview of key AR design concepts like blocking, occlusion, parallax, and more. 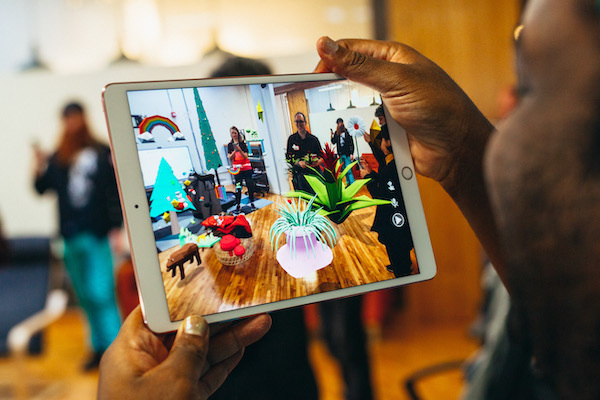 Then, we moved to existing use cases and the unique value of AR affords through concepts like true scale, shared 3D context, and space as an organizing tool If you’re interested in learning more about these basics, there are great online resources available. I suggest starting with the Google AR guidelines. In a group augmented reality prototyping session, I asked people to trim a holiday tree in the AR prototyping tool Torch. The goal was for everyone to join a single collaborative project and then add objects, interactions, and experience the capabilities of the app. This is what I thought I would get. My expectation of what an AR tree trimming would look like. The reality of collaborating simultaneously with 15 designers. However, AR collaborating with 15 designers became a little too chaotic. So while the environment was filled with 3D models, the tree in the workshop did not get a lot of decorations on it. For the hands-on segment of the day, I gave the designers a brief to create something in AR that would leverage the design affordances of 3D objects, embodiment, and integrating the real environment. Teams created an awesome range of experiences, including wayfinding guides, a zoo, wayfinding AT the zoo, and a planetarium for cats (aptly named a “cat-etarium”). Incorporated the real environment in digital experiences. In one of the zoo experiences, a team placed digital rodents near the actual trash cans in the room. Built different types of interactions that were triggered by the user’s gaze, tap, or her position in the room. Participants left with a broad understanding of the capabilities of augmented reality as well as hands-on experience working with interaction design for AR. I look forward to seeing more AR experiences from each of these participants. If you are interested in learning more about how to apply design principles in AR, use cases from diverse industries, and start creating in AR yourself, sign up for the next training on January 24th. Register today. Scholarships are available. This article is part four of the series that reviews the user testing conducted on Hubs by Mozilla, a social XR platform. Previous posts in this series have covered insights related to accessibility, user experience, and environmental design. The objective of this final post is to give an overview of how the Extended Mind and Mozilla collaborated to execute this study and make recommendations for best practices in user research on cross platform (2D and XR) devices. Research outcomes are driven by participant quality so plan to spend a lot of time up front recruiting. If you don’t already have defined target users, pick a user profile and recruit against that. In this study, Jessica Outlaw and Tyesha Snow of The Extended Mind sought people who were tech savvy enough to use social media and communicate on smartphones daily, but did not require that they owned head-mounted displays (HMDs) at home. The researchers’ approach was to recruit for the future user of Hubs by Mozilla, not the current user who might be an early adopter. Across the ten participants in the study, a broad range of professions were represented (3D artist, engineer, realtor, psychologist, and more), which in this case was ideal because Hubs exists as a standalone product. However, if Hubs were in an earlier stage where only concepts or wireframes could be shown to users, it would have been better to include people with VR expertise because they could more easily imagine the potential it. In qualitative research, substantial insights can be generated from between six and twelve users. Beyond twelve users, there tends to be redundancy in the feedback, which doesn’t justify the extra costs of recruiting and interviewing those folks. In general, there is more value in running two smaller studies of six people at different iterations of product development, rather than just one study with a larger sample size. In this study, there were ten participants, who provided both diversity of viewpoints and enough consistency that strong themes emerged. For testing a social XR product, consider having people come in with someone they already know. Beyond increasing user comfort, there is another advantage in that it was more efficient for the researchers. They completed research with ten people in a single day, which is a lot in user testing. Recruit participants who represent the future target user of your product (identifying user profiles is often a separate research project in user-centered design). The farther along the product is in development, the less technologically sophisticated users need to be. You can achieve important insights with as few as six participants. To test social products, consider bringing in people in pairs. This can also be efficient for the researchers. It’s important to make users feel welcome when they arrive. Offer them water or snacks. Pay them an honorarium for their time. Give them payment before the interviews begin so that they know their payment is not conditional on them saying nice things about your product. In fact, give them explicit permission to say negative things about the product. Participants tend to want to please researchers so let them know you want their honest feedback. Let them know up front that they can end the study, especially if they become uncomfortable or motion sick. The Extended Mind asked people to sign a consent form for audio, video, and screen recording. All forms should give people the choice to opt out from recordings. Pairs were together for the opening and closing interviews, but separated into different conference rooms for actual product usage. Jessica and Tyesha each stayed with a participant at all times to observe their behaviors in Hubs and then aggregated their notes afterward. One point that was essential was to give people some experience with the Oculus Go before actually showing them Hubs. This was part of the welcome and pre-Hubs interview in this study. Due to the nascent stage of VR, participants need extra time to learn about navigating the menus and controllers. Before people to arrive in any XR experience, people are going to need to have some familiarity with the device. As the prevalence of HMDs increases, taking time to give people an orientation will become less and less necessary. In the meantime, setting a baseline is an important piece for users about where your experiences exist in the context of the device’s ecosystem. Allow time for people to get used to navigating menus and using the controller on new HMDs before testing your experience. Once all the interviews have been completed, it’s time to start analyzing it the data. It is important to come up with a narrative to describe the user experience. In this example, Hubs was found to be accessible, fun, good for close conversations, and participants’ experiences were influenced by the environmental design. Those themes emerged early on and were supported by multiple data points across participants. Attempt to weave together multiple quotes to support each of the themes from the research. User testing will uncover new uses of your product and people will likely spontaneously brainstorm new features they want and more. Expect that users will surprise you with their feedback. You may have planned to test and iterate on the UI of a particular page, but learn in the research that the page isn’t desirable and should be removed entirely. In this study, Mozilla partnered with The Extended Mind to conduct the research and deliver recommendations on how to improve the Hubs product. For the day of testing, two Hubs developers observed all research sessions and had the opportunity to ask the participants questions. Having Mozilla team members onsite during testing let everyone sync up between test sessions and led to important revisions about how to re-phrase questions, which devices test on, and more. Due to Jessica and Tyesha being outside of the core Hubs team, they were closer to the user perspective and could take a more naturalistic approach to learning about the product. Their goals were to represent the user perspective across the entire project and provide strategic insights that the development team could apply. 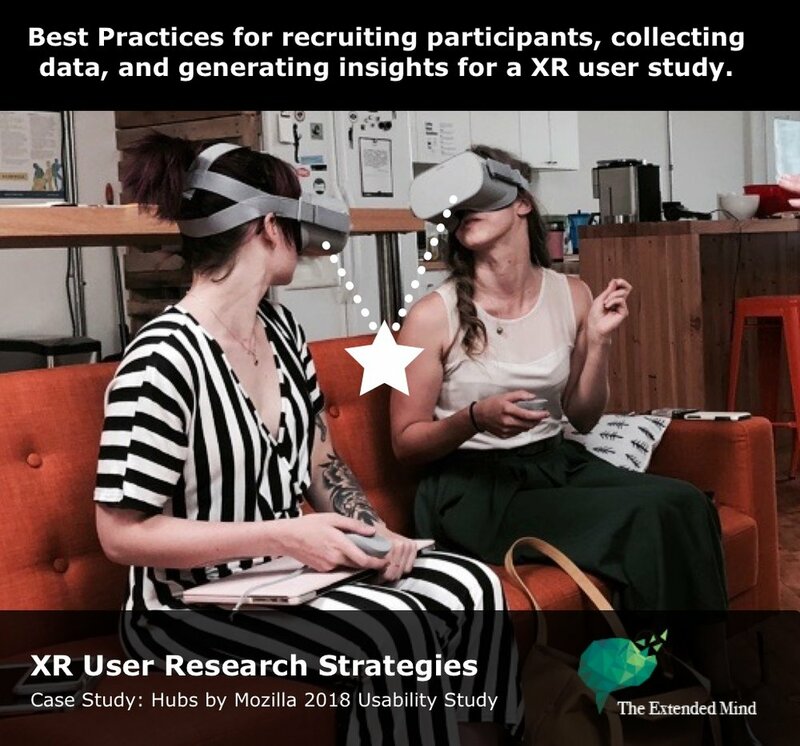 This post has provided some background on the Hubs by Mozilla user research study and given recommendations on best practices for people who are interested in conducting their own XR research. Get in touch with contact@extendedmind.io with research questions and, also, try Hubs with a friend. You can access it via https://hubs.mozilla.com/. This is the final article in a series that reviews user testing conducted on Mozilla’s social XR platform, Hubs. Mozilla partnered with Jessica Outlaw and Tyesha Snow of The Extended Mind to validate that Hubs was accessible, safe, and scalable. The goal of the research was to generate insights about the user experience and deliver recommendations of how to improve the Hubs product. Links to the previous posts are below. I am planning a series of workshops to teach XR design and research. Subscribe to my newsletter to be notified of 2019 course offerings. In previous research, The Extended Mind has documented [how a 3D space automatically signals to people the rules of behavior. One of the key findings of that research is that when there is synchrony in the design of a space, it helps communicate behavioral norms to visitors. That means that when there is complementarity among content, affordances, and avatars, it helps people learn how to act. One example would be creating a gym environment (content), with weights (affordances), but only letting avatars dress in tuxedos and evening gowns. The contraction of people’s appearances could demotivate weight-lifting (the desired behavior). This article shares learnings from the Hubs by Mozilla user research on how the different locations that they visited impacted participant’s behavior. Briefly, the researchers observed five pairs of participants in multiple 3D environments and watched as they navigated new ways of interacting with one another. In this particular study, participants visited a medieval fantasy world, a meeting room, an atrium, and a rooftop bunker. To read more about the details and set up of the user study, read the intro blog post here. The rest of the article will provide additional information on each of the insights. Users immediately began exploring the space and quickly taught themselves to move. This might have been because people were new to Hubs by Mozilla and Social VR more generally. The general takeaway is that XR creators should give people something to discover once they arrive. Finding something will will be satisfying to the user. Platforms could also embrace novelty and give people something new to discover every time they visit. E.g., in Hubs, there is a rubber duck. Perhaps the placement of the duck could be randomly generated so people would have to look for it every time they arrive. While spatialized audio has multiple benefits and adds a dimension of presence to immersive worlds, in this case, people’s lack of understanding meant that they sometimes had sound issues. When this was combined with people immediately exploring the space when they arrived earlier than their companion, it was sometimes challenging for people to connect with one another. This leads to the second insight about size of the space. This is another opportunity to consider use cases for for any Social VR environment. If the use case is conversation, smaller rooms lead to more intimate talks. Participants who were new to VR were able to access this insight when describing their experience. This quote illustrates how size signaled privacy to users. It is also coherent with past research from The Extended Mind on how to configure a space to match users’ expectations. …when you go to a large city, the avenues are really wide which means a lot of traffic and people. vs. small streets means more residential, less traffic, more privacy. All of those rules still apply [to XR]. There is a final insight on how the environment shapes user behavior and it is about objects change people’s perceptions, including around big concepts like privacy. There were two particular Hubs objects that users responded to in interesting ways. The first is the rubber duck and the second is a door. What’s interesting to note is that in both cases, participants are interpreting these objects on their own and no one is guiding them. The rubber duck is unique to Hubs and was something that users quickly became attached to. When a participant clicked on the duck, it quacked and replicated itself, which motivated the users to click over and over again. It was a playful fidget-y type object, which helped users understand that it was fine to just sit and laugh with their companion and that they didn’t have to “do something” while they visited Hubs. In reality, the door was not functional. Hubs’ locations are entirely private places accessible only via a unique URL. What’s relevant to all creators is that their environmental design is open to interpretation by visitors. And even if creators make attempts to scrub out objects and environments sparse, that will just lead users to make different assumptions about what it is for. One set of participant decided that one of the more basic Hubs spaces reminded them of an interrogation room and they constructed an elaborate story for themselves that revolved around it. Environmental cues can shape user expectations and behaviors when they enter an immersive space. In this test with Hubs by Mozilla, large locations led people to roam and small places focused people’s attention on each other. The contents of the room also influence the topics of conversations and how private they believed their discussions might be. All of this indicates that XR creators should consider the subtle messages that their environments are sending to users. There’s value in user testing with multiple participants who come from different backgrounds to understand how their interpretations vary (or don’t) from the intentions of the creator. Testing doesn’t have to be a huge undertaking requiring massive development hours in response. It may uncover small things that could be revised rapidly — such as small tweaks to lighting and sound could impact people’s experience of a space. For the most part, people don’t feel like dim lighting is inviting and a test could uncover that early in the process and developers could amp up the brightness before a product with an immersive environment actually launches. The final article in this blog series is going to focus on giving people the details of how this Hubs by Mozilla research study was executed and make recommendations for best practices in conducting usability research on cross platform (2D and VR) devices. 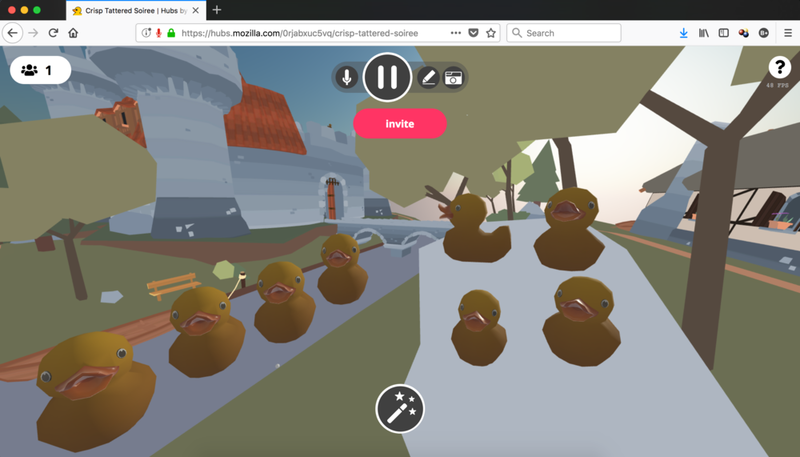 This article is part three of the series that reviews the user testing conducted on Mozilla’s social XR platform, Hubs. Mozilla partnered with Jessica Outlaw and Tyesha Snow of The Extended Mind to validate that Hubs was accessible, safe, and scalable. The goal of the research was to generate insights about the user experience and deliver recommendations of how to improve the Hubs product. To read part one of on accessibility, click here. To read part two on the personal connections and playfulness of Hubs, click here. In many user experience (UX) studies, the researchers give participants a task and then observe what happens next. Most research participants are earnest and usually attempt to follow instructions. However, in this study, research participants mostly ignored instructions and just started goofing off with each other once they entered the immersive space and testing the limits of embodiment. The goal of this blog post is to share insights from Hubs by Mozilla usability study that other XR creators could apply to building a multi-user space. The Extended Mind recruited pairs of people who communicate online with each other every day, which led to testing Hubs with people who have very close connections. There were three romantic partners in the study, one pair of roommates, and one set of high school BFFs. The reason that The Extended Mind recruited relatively intimate pairs of people is because they wanted to understand the potential for Hubs as a communication platform for people who already have good relationships. They also believe that they got more insights about how people would use Hubs in a natural environment rather than bringing in one person at a time and asking that person to hang out in VR with a stranger who they just met. The two key insights that this blog post will cover are the ease of conversation that people had in Hubs and the playfulness that they embodied when using it. …which indicates that his warm feelings for her in the real world easily translated to her avatar. The youngest participants in the study were in their early twenties and stated that they avoided making phone calls. They rated Hubs more highly than a phone conversation due to the improved sense of connection it gave them. The data from this study shows that communication using 2D devices and VR headsets has strong potential for personal conversation among friends and partners. People appeared to feel strong connections with their partners in the space. They wanted to revisit the space in the future with groups of close friends and share it with them as well. Due to participants feeling comfortable in the space and confident in their ability to express themselves, they relaxed during the testing session and let their sense of humor show through. 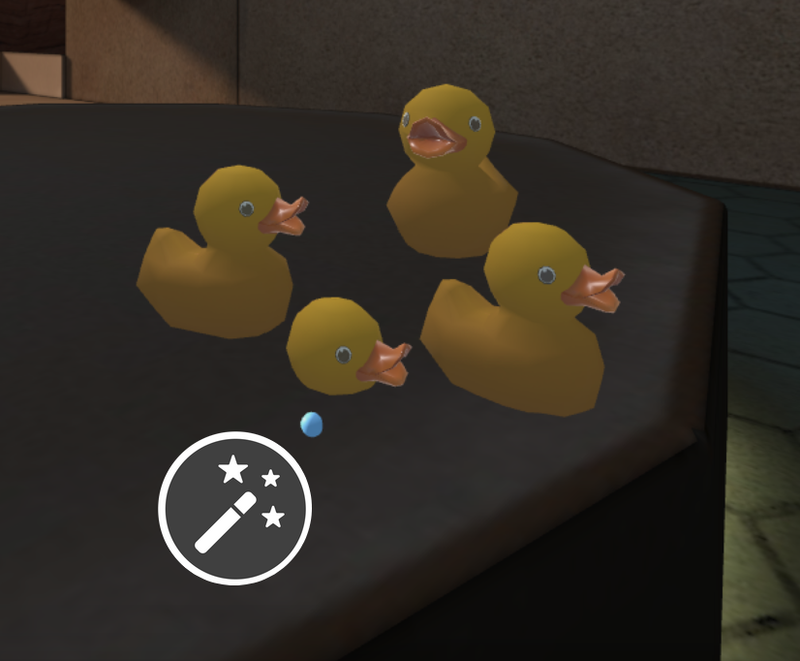 Users also discovered that Hubs has a rubber duck mascot that will quack when it is clicked and it will replicate itself. Playing with the duck was very popular. People either forgot or ignored the researchers’ instructions to plan a vacation or other prompts because they were immersed in the fun and connection together. However, the watching the users tell each other stories and experiment in the space was more entertaining and led to more insights. While it wasn’t actually tested in this study, there are ways to add media & gifs to Hubs to further enhance communication and comedy. The Extended Mind believes that the privacy of the Hubs space bolstered people’s intimate experiences. Because people must have a unique URL to gain access, it limited the number of people in the room. That gave people a sense of control and likely led the them feeling comfortable experimenting with the layers of embodiment and having fun with each other. The next blog post will cover additional insights about how the different environments in Hubs impacted their behavior and what other XR creators can apply to their own work. This article is part two of the series that reviews the user testing conducted on Mozilla’s social XR platform, Hubs. Mozilla partnered with Jessica Outlaw and Tyesha Snow of The Extended Mind to validate that Hubs was accessible, safe, and scalable. The goal of the research was to generate insights about the user experience and deliver recommendations of how to improve the Hubs product. To read part one of the blog series overview, which focused on accessibility, click here. In the course of building the first online social platform for VR and AR on the web, Mozilla wanted confirm it was building a platform that would bring people together and do so in a low-friction, safe, and scalable way. With her years of experience and seminal studies examining the successes and pitfalls of social VR systems across the ecosystem, Jessica Outlaw and Tyesha Snow of The Extended Mind, set out to generate insights about the user experience and deliver recommendations of how to improve the Hubs product. In July 2018, The Extended Mind recruited five pairs of people (10 total) to come to their office in Portland, OR and demo Hubs on their own laptops, tablets, and mobile phone. We provided them with head-mounted displays (HTC Vive, Oculus Rift & Go) to use as well. In this series blog posts, The Extended Mind researchers will cover some of the research findings about the first-time user experience of trying Hubs. There are some surprising findings about how the environment shaped user behavior and best practices for usability in virtual reality to share across the industry. Today, the focus is on how the accessibility of Hubs via a browser differentiates it from other social VR apps as well as other 2D communication apps like Skype, BlueJeans, and Zoom. The process for creating a room and inviting a friend begins at http://hubs.mozilla.com. Once there, participants generated a link to their private room and then copied and pasted that link into their existing communication apps, such as iMessage or e-mail. Once their companion received the link, they followed instructions and met the person who invited them in a 360-environment. This process worked for HMDs, computers, and mobile phone. When participants were asked afterward about the ease of use of Hubs, accessibility via link was listed as a top benefit. Some believed that because links are already familiar to most people, they would be able to persuade their less technologically sophisticated friends & family members to meet them in Hubs. Another benefit of using the browser is that there is already one installed on people’s electronic devices. Obstacles to app installation range from difficulty finding them in the app store, to lack of space on a hard drive. One person noted that IT must approve any app she installs on her work computer. With Hubs, she could use it right away and wouldn’t need to jump that hurdle. Because Hubs relies on people’s existing mental models of how hyperlinks work, only requires an internet browser (meaning no app installation), and is accessible from an XR or 2D device it the most accessible communication platform today. It could possibly be the first digital experience that people have which gets them familiar with the with the concepts of 360 virtual spaces and interacting with avatars, which subsequently launches them into further exploration of virtual and extended reality. Now that you’ve got a sense of the capabilities of Hubs, the next blog posts will cover more specific findings of how people used it for conversation and how the environment shaped interactions. The final post goes through the nuts and bolts of running a XR user study. Clorama Dorvilias and I are thrilled to announce that Teacher’s Lens is freely available in the Oculus store. Clorama and I met June 2017 at Oculus Launch Pad and formed a bond over our interest in de-biasing public school teachers using a VR experience. 40 years of education research has demonstrated that TEACHER EXPECTATIONS PREDICT STUDENT PERFORMANCE. It’s a stronger factor than their level of subject knowledge, their training…even home and family conditions are weaker influences of student success compared to teacher’s belief in them. And secondly, white teachers have systematically lower expectations of Black and Latino students  and female students in STEM classes by as much as 30%   & . What does this mean when classrooms are projected to grow to 50% students of color by 2020? So we went about trying to make an experience that would increase teacher’s expectations of all of their students. Teacher expectations are a lens to students and it can mean the difference between a student being labeled enthusiastic or disruptive. Black and Latino students are disciplined at high rates and tracked into fewer AP classes so there are very high stakes in teacher decision-making. “Leveraging VR technology, we believe we can restore equity in the classroom using evidence based training simulations, proven to reduce hidden bias in teachers that lead to better student outcomes. Teacher’s Lens is the first VR solution to be implemented that allows for measurable training towards diversity & inclusion goals. It’s not only proven to be a more engaging tool to handle these tough topics, but it also allows for corporations and educational institutions to measure impact, track progress, and collect data to inform more effective initiatives addressing these very real problems. Teacher’s Lens takes a unique approach to bias training in VR. This app is just a glance of the potential for immersive VR to better engage users with elements of playfulness to address tough topics. Help us make it better by downloading the app for the Oculus Rift and tell us what you think! Tweet your comments to @debiasvr on Twitter and follow @creativeclo for product updates. You can read the other coverage of the app from the Oculus and Unity developer blogs. And if you would like to speak with us about creating customized de-biasing trainings for you, contact us here. Working together with Clorama on this project has been an amazing opportunity and I’m grateful to her for her friendship, technical capabilities, and leadership to make this app happen. The majority of respondents prefer to spend time with friends or people they already know instead of strangers. Secondly, being there with friends makes those multiplayer VR experiences more enjoyable. The net effect of the harassment and then the subsequent denial of there being any harassment is that people are finding ways to spend time with people they already know or escape to single user VR apps. The full report on this social VR survey is available here and it contains more info on my approach, survey respondents’ VR usage patterns, and their privacy preferences. The Extended Mind and Pluto VR are holding two Fireside Chats in VR. The first one will be on Tuesday, April 17, at 1 p.m. PST. The second is on Wednesday, May 2, at 11 a.m. PST. Both will be held in VR using the Pluto communication service. You are invited to participate live by joining a Pluto conversation with SerahD, Forest, and me during those times. Pluto is available for download on Steam. I’ll also post a mixed reality video recording on YouTube after each of these events. For more info or to sign up to be notified of the events, click here. See you at the Fireside chat! Pluto VR is a Seattle-based startup that is dedicated to helping humanity transcend physical location. The company has developed a free communication service that allows people to communicate remotely as if they were physically present with each other. Learn more about Pluto VR and the Pluto communications service at www.plutovr.com. Hello - quick announcement that I'm giving my first talk in VR on Friday. Event will be in High Fidelity on Friday at 2pm Pacific. The Behavioral Science of High Fidelity: I will be speaking on how open source changes people's psychology, how social norms get established, and why physical movement increases shared presence in VR. Bring your questions about the social science of VR to the Zaru Theater June 2nd at 2pm Pacific. You can connect using VR or your PC. Download High Fidelity here: https://highfidelity.com/download. The wax statues were over the uncanny cliff. I was in NYC to give a talk about the behavioral science of immersive technology. While I was there, I went to The Void’s Ghostbusters Dimension Hyper-Reality and a production of Sleep No More. In my next blog post, I’ll write about Sleep No More. First up is Ghostbusters (unrelated to the PSVR game). Spoilers! The Void’s Ghostbusters Dimension is a VR experience offered inside of Madame Tussaud’s Wax Museum, which is located in the Times Square area of New York City. If you haven’t been to Times Square before, this should give you an idea of what to expect around there. I should have known given the hyper-touristy nature of Times Square that The Void’s Ghostbusters wasn’t for me. Anything designed for tourists is not going to appeal to someone with specialized knowledge. The Void has made a terrific VR experience for the general consumer, but as someone who has logged hours on a Vive, I was underwhelmed. It felt like a cinematic experience. The art and animation was outstanding. However, it wasn’t fun, especially when you compare it to a something like Epic Games’ Robo Recall. Here’s The Void’s promotional video. You can get a sense of the the art and animation. Time, BBC, Wired, FastCompany, Forbes, Tech Insider, and Popular Mechanics. Have you ever looked for an entertainment recommendation from Popular Mechanics?? That’s where people go to compare reliability ratings between Hondas and Toyotas. Ghostbusters felt like a cinematic storytelling experience only. I felt like I had zero autonomy or agency in the experience. There was no potential to fail. Risk is part of what makes games feel fun. Ghostbusters has scrubbed out all threats and automated the experience. It seemed like there was no interactivity between me and the ghosts that I was shooting. o My avatar was never damaged by the projectiles that the ghosts threw at me. o It felt like the ghosts were on a timer and were going to be defeated no matter how much or how little I shot them. I was shadowed by an employee during the experience. o He told me before I put the headset on that if I ever needed help I could raise my hand. o At one point when I had stopped to look at some animations, he lifted the headphone off of my ear and told me to proceed to my right. He assumed that I was stuck. I was aware of there being other consumers waiting for me to complete the experience so that they could take a turn. o I suspect that there’s no risk in Ghostbusters because they need to cycle consumers through to keep it profitable. If people need multiple attempts to defeat the boss, that would take too long. Plus, some consumers won’t enjoy having to make multiple attempts. o Contrast this with Schell Games’ I Expect You to Die, a game with no time constraints. The creators expect you to need multiple attempts to complete a level. And each level gets subsequently more challenging to solve. It seems like they made a safe bet and decided to provide a terrific viewing experience. I wouldn’t call it a gaming experience. There were a couple things inside of the experience that you wouldn’t get in a normal HTC Vive session. One, they had an elevator simulation that was cool. You stepped onto a platform and it shakes and rumbles. The HMD animation makes it appear as though you are going up several floors and being approached by creepy ghosts. You are sprayed with water when a ghost touches your face. There’s also a rickety bridge that you have to cross, which messes with your balance. Lastly, when the Marshmallow Man is defeated, you have the scent of roasted marshmallow around you. I see the potential for VR arcades. There is an opportunity to build in robust multi-sensory experiences in an arcade that you wouldn’t have at home. But, my take is that arcades are unlikely to appeal to someone like me who already has unfettered Vive / Rift / PSVR access. Compared to a recent VR release like Robo Recall, Ghostbusters is vanilla in comparison. In Robo Recall, you go at your own pace. I died and respawned. I was confronted with choices constantly. It’s highly immersive — I got surprised by the robots. I punched the desk in my VR room until my hand was numb. I was really into shooting those robots. Ghostbusters is a pretty flat experience in comparison. It’s over in ten minutes. I made zero choices. I was trailed by employees making sure that I stayed on track. They would have stopped me before I hurt myself. Consider who your experience is for. Is it going to be for a VR savvy audience? Or, readers of Popular Mechanics? Chose the level of automaticity that fits your goals. Kent Bye has created an Elemental Theory of Presence to piece together the different aspects of VR (film-making, gaming, emotional resonance, etc) and how they best fit together. I would recommend this be used in conceptual discussions of all VR development so at least you are clear on what your goals are. Want to create something similar to Ghostbusters? Space is not your primary constraint. I believe that the room I was in was only about 20 feet by 30 feet total. In my next post, I’ll give a rundown of Sleep No More, a theatrical production of MacBeth and takes place in a four-story building in NYC. The audience trails the actors around the set for three hours so I’ll talk about the implications for immersive storytelling. Facebook released the beta version of Spaces today. After using it for an hour today, here are are my initial comments. This is written for people who haven't had a chance to use Spaces yet. You start by logging into your Facebook account and customizing an avatar. Other people see your name and Facebook profile picture above your avatar. My biggest issue was how to select things. I’ve never had a good handle on using the Oculus Touch controllers. Someone in my office had to coach me to extend my finger and actually touch things and/or extend finger and use the x button. Even after the coaching, it took me multiple tries to get it right. Hmmm, what type of beard do I want? The primary tools are a mirror, a selfie-stick and a pencil you can use to write in the air. There’s also things like stickers and pre-made drawings that you can use to decorate your environment. Our space got a little cluttered with graffiti so we left rather than figure out how to clear it. Big Screen Beta has acclimated me to being able to share videos and monitor a screen when I’m hanging out in VR. Spaces already feels dated because it doesn’t offer that feature. Freeze and crash after I pushed "video call." 1. My friend using a Vive was frozen and I could only see him blink and move his mouth. I couldn’t see anything else that he did or made. 6. The setting of the park was unappealing to me. In the park, I felt like a creepy person spying on these couples having a day out. I’d prefer to be solo in a beautiful environment. 7. Making a Facebook Messenger call crashed the application…twice. 8. When Facebook Messenger did connect, only I could see my friend on the “tablet.” No one else connected via VR could see or hear him. 10. I didn’t know how to change the audio from the Oculus headset to the computer speakers so that everyone else in the room could hear my conversation. There were four other people in the room with me and I had to repeat what I heard for their benefit. 11. When the anyone in the room with me spoke, the lips of my avatar moved. Despite the technical challenges, I had fun. But why? Was it because Eva Hoerth was there? Eva could probably cheer me up at my grandmother’s wake. Overall, it validates a belief that private VR spaces where you hang with friends will be appealing, but that’s hardly a new idea. Was it fun because everyone I interacted with was acting a bit silly? Are goofballs the key to social VR’s success? The novelty of it made the experience fun. But, will people quickly habituate and the novelty decrease? Perhaps, but I typically hang out in the exact same environment every time I hang out with friends. We spend time in my living room - but it’s often different people and we do a variety of things. Overall, it’s a good use of the Facebook infrastructure, leveraging friend networks, Messenger calls, sharing on your feed, but it still feels very beta. Would you trust Louis CK to design your Social VR experience? In January, I gave a talk on social cognition in VR and two different people asked at the end if harassment will end once your VR avatar really looks like you. No. Higher resolution facial feedback will just let your abuser know when they land a direct hit. Or, if VR creators hadn’t seen the actual video clip, they knew about the idea from hearing other people paraphrasing Louis CK. For example, Tim Sweeney of Epic Games in a December 2016 interview with The Verge. Let’s set aside the impact on the culture of VR of having a solo comedian hold this much influence over how people in our industry think. Instead, look at the content: Louis CK’s belief is that people will only behave if they experience getting negative feedback from acting like a bully. This sentiment is highly problematic. It relies on people making the right decision because it feels good for them, rather then it being the right thing to do. Now, I genuinely believe that the warm glow effect is real. When you donate to good causes, give advice to a friend, lend tools to your neighbor, etc, that feels good. However, I think the reason that we should encourage people to behave well and treat others with respect is because it’s the right thing to do, not because they’ll get something out of it. Throwing enough engineering resources to achieve photorealism isn’t going to solve harassment. Teaching people how to behave and setting social norms has much higher and faster returns. Spend your resources to set up social rules and patterns of behavior in your environment that teach people how to act. Give people activities that teach them how to treat one another. Once people form social connections and feel like they are part of a group, you’ll see more of the behavior that you designed for. Lastly, people don’t even like photorealism. People like animals and cute robots. See my blog post on the uncanny valley and how photorealism reduces liking. Watch Louis CK’s new Netflix special “2017” if you want a preview of what VR creators are going to be saying to each other four years from now. VR will not inherently make people better people. However, creating strong social rules and norms for positive behavior in your environment will make people act better. Our human desire for meaning is the future of VR. "If you don't have a job anymore and the government provides you with universal basic income, the big problem is how do you find meaning in life. What do you do all day? And here the best answer so far we've got is drugs and computer games. People will regulate their moods with all kinds of bio-chemicals and they will engage with 3-dimensional virtual realities that they’ll be absorbed in [sic], and these things will provide emotional engagement and interest more than anything in the outside world. This idea of humans finding meaning in virtual reality games is actually not a new idea. It's a very old idea. We have been finding meaning in virtual reality games for thousands of years, we've just called it religion until now." "This idea of humans finding meaning in virtual reality games is actually not a new idea. It's a very old idea." "You can think about religion simply as a virtual reality game. You invent rules that don't really exist. It's just in your mind. But you believe these rules and for your entire life, you try to follow the rules. If you're Christian then if you do this, you get points. If you sin, you lose points. If, by the time you finish the game (when you are dead), you gain enough points you get up to the next level. You go to heaven. People have been playing this virtual reality game for thousands of years. It made them relatively content, happy with their lives. In the 21st century, we'll just have the technology to create far more persuasive virtual reality games than the ones we've been playing for the last thousands of years. We'll have the technology to actually create heavens and hells, not in our minds, but using bits and using direct brain-computer interfaces." Whatever your religious beliefs, Harari’s perspective that VR will become a primary source of meaning in our lives is dystopian. Considering that VR will offer higher emotional engagement and interest than outside of the headset, it’s clear that people can easily fall into narratives that they don’t have control over or even choice in. That is what Harari is calling the ‘heavens and hells’ of our own creation. If people have a behavioral pattern to find meaning inside of VR, will they spend more or less time in VR? Obviously, more time. Adam Alter, a psychologist at NYU, published a new book about digital addictions called Irresistible. You can buy it here. VR has the potential to replace religion—defining religion as the stories we tell ourselves to find meaning in life. VR experiences will be addictive. It’s unlikely that people will come up with new ideas and stories for themselves. People will become addicted to the heavens and hells that you create for them. H/t to Austin Ramsland for directing me to the Vox interview with Yuval Noah Harari. Link to the original podcast is here. Interview with Adam Alter in the NY Times. Adam Alter. Irresistible: The Rise of Addictive Technology and the Business of Keeping Us Hooked. I was reading University of Illinois professor Steve LaValle’s book Virtual Reality and he makes a forceful argument for doing research in any VR experience. LaValle starts out talking about research by talking about the difference between having a first-person vs. third-person perspective. "When a scientist designs an experiment for an organism, as shown in Figure 1.2, then the separation is clear: The laboratory subject (organism) has a first-person experience, while the scientist is a third-person observer. The scientist carefully designs the VR system as part of an experiment that will help to resolve a scientific hypothesis. For example, how does turning off a few neurons in a rat’s brain affect its navigation ability?" "On the other hand, when engineers or developers construct a VR system or experience, they are usually targeting themselves and people like them. They feel perfectly comfortable moving back and forth between being the 'scientist' and the 'lab subject' while evaluating and refining their work…this is a bad idea!" "The creators of the experience are heavily biased by their desire for it to succeed without having to redo their work. They also know what the experience is supposed to mean or accomplish, which provides a strong bias in comparison to a fresh subject. VR disrupts the ordinary perceptual processes of its users…It is hard to predict how others will react to your own writing. Also, it is usually harder to proofread your own writing in comparison to that of others. In the case of VR, these effects are much stronger and yet elusive to the point that you must force yourself to pay attention to them. You have incentives to believe that first-time users will understand your experience, but testing is the only way to really find out. LaValle’s book is a great resource for all things VR. It’s downloadable here. This is part two of a series on what uncanny and the uncanny valley mean and how to accurately use them to describe experiences (in VR or otherwise). The Uncanny valley is specifically about the relationship between being human-like and likability. 1919 – Sigmund Freud published an essay called The Uncanny” (translated from the German unheimlich), defining it to mean weird/eerie/unfamiliar. 1970 – Valley of Eeriness (translated from the Japanese bukimi no tani) was coined by robotics professor Masahiro Mori to model affinity for androids as they become more humanlike. 2007 – Uncanny Cliff was introduced to more accurately reflect the shape of the curve. What Is the Uncanny Valley? The uncanny valley is a very precise feeling of weirdness or fear that nearly-humans (but not quite humans) evoke. The uncanny valley is elicited when a robot or AI has some human likeness, but isn’t human. Long time art director and VR/AR insider Spencer Lindsay uses “creepy corpse” in his definition of the uncanny valley. It’s assumed that liking of a robot increases the more human like that it is, until it crosses into the valley (the grey area). Lindsay’s creepy corpse would appear to be at the nadir of the valley – with zombies! It is likely that the uncanny valley response is evolutionarily adaptive. Studies done with rhesus monkeys show a similar pattern of likability. Monkeys will look longer at the unrealistic (left) and real (right) faces below, rather than the realistic one in the center. The Uncanny Valley Confuses Categories. To categorize is a fundamental psychological process that happens automatically. The very act of perception involves an act of categorization. You haven’t completed the process of perception until you have categorized it and matched it up to other things that you know about. That is, “this object is the same as other things I know about and different from these other things.” We judge new things based on their similarity to previous things. And a human-like puppet easily confuses our judgment process. "Do I sleep with him or not? Is that a boy or a girl? Is that predator or prey? If you solve how this process works, then you solve how you know things." Encountering a creepy android from the trough of the uncanny valley leads to conflicting perceptual cues. Is it human or not? It interferes with the automatic, System 1 processing that we rely on to get through our day. The Uncanny Valley Is an Uncanny Cliff. Lastly, there have been empirical studies that map the uncanny valley since Mori originally theorized it. Researchers show 11 different images as an object morphs from a thing to a human, and there is a decrease in liking midway through. "The uncanny valley appears to be more of a cliff than a valley since even pictures of humans do not reach the level [of likeability] of pictures of toy robots. It has to be acknowledged that there is a small upwards trend again towards highly human-like entities, which results in a small valley. However, the most dominant feature in the graph is not the valley, but the cliff preceding it." – Bartneck et al. The uncanny valley doesn’t actually exist. It’s more like a cliff. Once you get too humanoid, liking decreases dramatically and never fully returns. If you are interested in the uncanny valley, you’ll like Kimberley Voll’s interview on the fidelity contract. Listen to her full interview with @VoicesofVRKentBye here. Bartneck, C., Kanda, T., Ishiguro, H., & Hagita, N. (2007). Is the Uncanny Valley an Uncanny Cliff? Proceedings of the 16 th IEEE International Symposium on Robot and Human Interactive Communication, RO-MAN 2007, Jeju, Korea, pp. 368-373. H/T to @spencerlindsay for letting me quote him here. Freud wrote an essay in 1919 arguing that the origin of the uncanny is the loss of one’s eyes. If you are covering a person’s eyes with an HMD, no wonder it brings up feelings of strangeness. Uncanny is an adjective best used to describe something weird or unexpected. It is defined in relation to the familiar or expected. People are overgeneralizing and applying this very precise term to any VR experience that they don’t like. It’s like using “epic” for anything that is even mildly interesting, or “interesting” to describe, well, anything. To elevate discussions of VR, I am going to dissect the meaning and use of “uncanny” in the context of current experiences, so people can confidently describe their subjective experiences of VR & AR with a richer vocabulary. "The Uncanny” is an essay from 1919, written by Sigmund Freud. While most of Freud’s work has been discredited, this essay remains relevant to VR creators who are making new experiences. The first third of the essay describes what uncanny means in terms of aesthetics and psychology. He states that the uncanny is the aesthetic of anxiety and fear, rather than the aesthetic of beauty. Freud (being who he is) argues that the origin of the feeling of uncanny is a revival of repressed infantile memories or the return of primitive beliefs of the human species. He also spends a long time giving a psychoanalytic perspective on a story from 1817 called “The Sandman” wherein a man who was traumatized in childhood by almost having his eyes removed falls in love with a woman who turns out to be a doll with unusual eyes. At some point he sees the doll’s eyes on the floor, loses it, and is committed for insanity. Freud believes that the origin of uncanny is the loss of one’s eyes. What does this mean for someone creating for an HMD? 1. belonging to the house; friendly; familiar; tame (as in animals); intimate, comfortable; i.e: secure, domestic(ated), hospitable. 2. concealed, secret, withheld from sight and from others; secretive, deceitful = private. 1. unhomey, unfamiliar, untame, uncomfortable = eerie, weird, etc. 2. unconcealed, unsecret; what is made known; what is supposed to be kept secret but is inadvertently revealed. (BTW - This would be related to a Freudian slip, saying something accidentally that reveals a hidden truth). Given these definitions of uncanny, I believe that most of the time that people use the phrase “uncanny valley,” they likely mean uncanny. They want an adjective to describe something unfamiliar, eerie, or unexpected. In my next post, I’ll write about the meaning and use of the term Uncanny Valley, coined by a robotics professor in Japan in 1970. Until then, feel free to use “inconceivable” as your general VR adjective. Uncanny is an adjective best used to describe something weird or unexpected. It’s about the relationship to something familiar or expected. If you don’t want your VR experience to feel quite so uncanny, amp up the heimlich elements of your experience. What can you do to make it more familiar, tame, or hospitable? With current devices, you lose sight of your own surroundings, plus you cannot see the eyes of others, or what they are looking at. If Freud was right and the loss of eyes is the source of the uncanny, we might have to resign ourselves to VR being perceived as uncanny for the near future. Freud, S. (1919). The uncanny. Lecture Notes on Freud’s The uncanny. University of Washington. H/T to German scholar Elizabeth Bridges who pointed me to Freud’s essay and patiently answered my questions. You can find her writing on the Uncanny Valley here. Empathy is a real buzzword in the world of VR. VR filmmaker Chris Milk has said he aspires to build the ultimate empathy machine. The purpose of the iAnimal series seems to be to raise people's empathy for animals in order to activate their moral reasoning that animals deserve better treatment. Participants were asked how capable they thought blind people were of working and living independently. But before answering the question, some were asked to complete difficult physical tasks while wearing a blindfold. Those who had done the blindness simulation judged blind people to be much less capable. That’s because the exercise led them to ask "what would it be like if I were blind?" (the answer: very difficult!) rather than "what is it like for a blind person to be blind?" People are so egocentric that even empathy tasks get reframed to be first person perspective. Humans are not terribly good at predicting how others feel. Yale psychology professor Paul Bloom wrote an entire book called Against Empathy that advocates using reason rather than empathy. While there is certainly a role for empathy and compassion in life, it can sometimes narrowly focus us on the wrong details. And empathy does not appear to be a reliable way to activate people’s moral reasoning. Another example of the underbelly of empathy is its ability to give people a reason or motive to be hurtful toward others. In a study where people were primed to empathize with someone (Person A), the research participants assigned Person A’s competitor (Person B) to eat more hot sauce as a punishment. It appears that creating an intervention that increases empathy toward Person A increased aggression toward Person B. Rather than relying on empathy to guide fairness, ask people to make judgments based on logic and reasoning. Gather data by actually speaking with people about their experience, rather than just imagining how they feel. Lastly, here’s a link to Paul Bloom speaking on how empathy blinds us to the long-term consequences of our decisions. Does Empathy Guide or Hinder Moral Action? The New York Times. December 29, 2016. http://www.nytimes.com/roomfordebate/2016/12/29/does-empathy-guide-or-hinder-moral-action. Waytz, Adam. The Limits of Empathy. Jan-Feb 2016. https://hbr.org/2016/01/the-limits-of-empathy. Bloom, P. (2017). Against Empathy. Bodley Head Limited. Shamoon, Evan. Virtual Immersion into the Reality of Farm Animals. Feb 24, 2016. http://www.laikamagazine.com/reality-animal-suffering/. NBA players who touch each other during games (fist bump, high-five, head grab) cooperate more and outperform their prickly counterparts on other teams. Consider the effect of mimicking those high-fives, hugs, and team huddles in your VR experience – people would feel a high sense of trust and liking for others. Come learn the behavioral science of how body movement influences thoughts, language, and decisions. Psychology and neuroscience research has established that human behaviors are affected by characteristics that you might not think would affect them – just pulling an item toward yourself leads to greater desire and willingness-to-pay for it. This talk will address how simple physical movements affect people’s decision processes and how to optimize them in VR interaction design. VR designers can create a broad range of emotional responses (empathy, courage, competitiveness, etc.) just by designing the right movements and gestures for users to do inside of their experiences. No haptics required. Ticket includes beer, wine, snacks and VR demos on HTV Vive, Oculus, and Gear VR. Buy yours here. Are you interested in boosting player performance? Giving people the right social environment will help them achieve more. NBA players who touch each other a lot during games (fist bump, high-five, head grab) cooperate more and outperform their prickly counterparts on other teams. Consider the effect of mimicking those high-fives, hugs, and team huddles in your VR experience – people will feel a high sense of trust and liking for others. I’m interested in how small things influence actions and decisions. Why would a small social gesture like a high-five help a professional athlete perform better? The stakes are extremely high for them so you might imagine they are already maxed out on motivation to win. Like most things in life, there’s an evolutionary explanation. People who belonged to a strong tribe knew that they could take more risks. In the event of a negative outcome, there were people who could care for you. These small things like fist bumps signal strong social ties. What are the limitations of the social placebo? Having an audience when doing a complicated task for the first time could sabotage performance. But, if it’s a straightforward action that doesn’t require any particular skill, having supporters would likely help. And it can be a complex activity, as long as the user has already rehearsed. Also, the encouragement should probably come from the person’s in-group. Does the social placebo work when you are surrounded by AI avatars instead of human avatars? Most likely. It might not last as long or be as effective compared to being around humans you know well and like, but a high five from an AI is likely better than no high five at all. How many viewers are optimal? It really depends on your goal. One person might be enough. Building a stadium of AI spectators might be overkill, but athletes do get a buzz from those national anthems, pre-game rituals, and cheering fans. Usage will increase if you build in social placebos. People will be perform at a higher level and have more fun. *Human runners go faster when they are under observation than when they are solo. Same effect in cockroaches. Those pests fun faster when other cockroaches are watching them. The human mind functions more like a coping mechanism than a well-oiled machine. We humans are easily fooled into erroneously believing that we have encountered people, objects, and events before when in fact we have not, especially when they are similar to ones that we have genuinely experienced. So what does this mean in VR? Somehow it has become ideal in VR to achieve a high feeling of presence (“being there”). However, the more real a VR experience feels to people, the more likely they are to confuse it with something similar that they have encountered in real life—something to keep in mind when designing darker VR experiences. But how does this work? It has to do with the malleability of memory. Any content online or offline can change your memory. Even telling a story at a dinner party about your childhood changes your memory of it. The process of recalling a memory itself strengthens it in comparison to other memories. In VR, the high presence and photorealism of Google Earth VR could easily lead to people making mistakes in their memory. For example, it would be easy to fool a native of Canton, OH by putting him in Google Earth VR, telling him he’s looking at Canton (when it’s actually Dayton, OH) and asking him to tell you a story about growing up in this neighborhood. I would guess that almost all people would tell you a memory of the place that did not actually occur there, and by doing so would be confusing their own memory of the event (where it actually happened). This is what can happen when photorealism intersects with the nature of memory—the more similar things are to authentic memories, the more likely one is to be tripped up. Canton or Dayton? You decide! "In the experiment participants took part in a self-guided museum tour where they were told to stop at particular exhibits along the way (St. Jacques & Schacter, 2013). These stops on the museum tour are the experimental stand-ins for the events you’ve experienced across your life. Participants were asked to look at a series of photos showing the stops they visited during their tour, a sort of ‘event-movie’, thus retrieving or reactivating memory. Following retrieval, they were shown a new photo taken at the museum that showed stops that were not part of their tour. ...In the study participants returned for a third session and were shown photos and asked whether they’d stopped at the exhibit or not. Once again, some of the time they were shown pairs of exhibits they had or hadn’t looked at and other times real and false memories were mixed up together. Across the three sessions, then, the researchers had simulated the recall of the jumble of real and false memories that are likely to be returned to consciousness when we try to recall past events. Real aspects of a memory get mixed up with false aspects and the whole confection gets stirred up each time we recall it. In the study they found that participants’ memories were both enhanced and distorted by the process of recall. People found it easier to remember those exhibits which they were subsequently shown photographs of. This shows that merely recalling a memory is enough to strengthen it. This is one illustration of how memory is an active, reconstructive process; recalling something is not a neutral act, but rather it strengthens the recalled memory in comparison to others. Human memory is easily influenced by fantasy. Giving people experiences in VR can subsequently alter their real life memories. Presence is not always desirable, especially if you are making dark, realistic content. Memory is one the pillars of human cognition, in addition to attention, problem-solving, evaluation, and decision-making. It is also extremely fragile and easy to influence. If our experiences and memories are what make each of us unique, then it is sobering to realize how unreliable human memory can be. Your brain is not a computer. Human memory does not behave like a computer. Memories are not files on a hard drive just waiting to be loaded. They are not fossils to be re-visited in a perfectly maintained museum. Just by reminiscing about an event in your life, your memory of that event is impacted. "How can recalling a memory change it? Well, just by recalling a memory, it becomes stronger in comparison to other memories. Let’s run this through an example. Say you think back to one particular birthday from childhood and you recall getting a Lego spaceship. Each time you recall that fact, the other things you got for your birthday that day become weaker in comparison. The process of recall, then, is actually actively constructing the past, or at least the parts of your past that you can remember. This is only the beginning though. False memories can potentially be created by this process of falsely recalling the past. Indeed, psychologists have experimentally implanted false memories. This raises the fascinating idea that effectively we create ourselves by choosing which memories to recall." "A neat experiment by Goff and Roediger (1998) demonstrates how easily our memory can transform fantasy into reality. Participants were asked either to imagine performing an action or actually asked to perform it, e.g. breaking a toothpick. Sometime later they went through the same process again. Then, later still they were asked whether they had performed that action or just imagined it. Those who imagined the actions more frequently the second time were more likely to think they’d actually performed the actions the first time." You might think - I can remember details about my childhood much better than if a researcher in a white coat asked me to break a toothpick. Possibly, though we tend to have the best memory for the most recent events. Think about the implications of this false memory study for VR. People could easily believe that what they experienced virtually happened in real life. It makes me wonder if creating realistic presence in VR should actually be a goal, given how it could affect people’s perceptions of reality. If you are interested in memory, it has been studied extensively by researchers in criminal justice. Cognitive psychologist Elizabeth Loftus has done tremendous work in false memory and the inaccuracies of eyewitness testimony. In short, eyewitnesses are not reliable due to poor viewing conditions, brief exposure, being under stress, having pre-conceived expectations, biases, stereotypes, and more. The human brain is not a computer. The act of recalling memories changes them. Maintain skepticism of the memories that people recount to you (and the memories that you personally retrieve). We are actively constructing our own experiences everyday. VR and AR rely on interactions from the participant. Being inside of VR/AR experiences requires the user to take action. Users in these open-loop systems have partial control over the experience by moving their eyes, head, hands, or legs. In the PSVR game Headmaster, the player moves his head in order to bounce incoming soccer balls into the net and score points. It’s an easy example of gameplay relying on player movement. • "You’re born to speak with your hands. Researchers have found that infants who use more hand gestures at 18-months old have greater language abilities later on. Hand gestures speak to great intelligence. • Gesturing helps you access memories. Using hand gestures while you speak not only helps others remember what you say, it also helps you speak more quickly and effectively! • Nonverbal explanations help you understand more. One study found that forcing children to gesture while they explained how to solve math problems actually helped them learn new problem-solving strategies." • "Gesture for persuasion - The way people’s hands cut through the air while they talk is…more than just a by-product of communication. Maricchiolo et al. (2008) found that hand-gestures help increase the power of a persuasive message when compared to no use of gesture. Most effective are gestures which make what you are saying more understandable. For example, when referring to the past, point behind you." fMRI brain imaging studies suggest that people tend to look for meaning in gestures when observing others. This means that VR/AR designers should be thoughtful when creating characters that gesture and limit gestures to things that are relevant and understandable to the user. The Extended Mind is a Portland-based research firm that applies behavioral science to increase user engagement in immersive technologies. Jessica Outlaw, the founder of The Extended Mind, is also a winner of the 2017 Oculus Launch Pad competition. Click here for an index of all blog posts. Apr 11, 2017 Louis CK: VR Futurist? Nov 3, 2016 Practical Tips on Time Travel: How to Transport Using Gestures in VR. Nov 1, 2016 Can you trust your own experience? Oct 25, 2016 Why is novelty important in VR/AR? Sep 20, 2016 Eschew Easy. Effort Makes it Better. Aug 31, 2016 What the hell is water?